A twist to the classic Greek dessert Galaktoboureko made with ewe’s butter and lemon curd. As I have said in a previous post, Galaktoboureko or galaktomboureko is one of my favourite Greek desserts. There is a place in Southern Attica, specifically in Vari, called Vlahika, where galaktoboureko is famous because it is made with ewe’s milk and ewe’s butter. A few decades ago, this area was full of sheep. As Vari is near the seaside it became a popular summer resort and fields where sheep grazed became holiday houses. A lot of tavernas opened in the area serving only lamb and there you could buy full fat Greek yoghurt made with ewe’s milk and confectioneries selling desserts made with ewe’s milk. Galaktoboureko was one the most prized desserts. The Athenians would visit there (and I use past tense as with the price of petrol and the economic crisis it’s no longer feasible) for their Sunday afternoon drive, just to eat galaktoboureko or in the evenings to enjoy food in their tavernas. My recipe today is a twist to the classic recipe, which I used to make in the restaurant I was working at. Sometimes we see a small addition in a recipe and think “why didn’ I think of that”? It’s these small ideas which add your signature to a classic recipe, especially if it something even better. I have lots of creative ideas and after making something new, I usually google search to see if someone else has made it before me but usually, most of what I search already exists. In this case, however, I am very happy to see that I was the first one to think of making this luscious dessert, even more decadent by adding lemon curd in the cream and more lemon in the syrup. If you love lemon flavour, you will love this one! The taste is just amazing!! You are watching a previous video I made for the Classic Galaktoboureko. A twist to the classic Greek dessert Galaktoboureko made with ewe's butter and lemon curd. Begin by preparing the syrup first so that it is not too hot when galaktoboureko is baked. Put the sugar, water, lemon peel, cinnamon stick and cloves in a saucepan. Bring to a boil and simmer for 5 minutes. Mix in the lemonade and lemon juice and remove from the heat. In a bowl whisk sugar and eggs until creamy. Add lemon zest and vanilla and mix. Heat the milk until tepid. Add it gradually to the egg mixture and stir until incorporated. Pour the mixture in a pot, add the semolina and mix. Put it on the heat and mix continuously with a balloon whisk, until the cream is thick. Remove from the heat and mix in the lemon curd. Grease a baking pan 32 x 23 x 6 cm or 12.5 x 9 x 2.5 inches, with butter. Cut the phyllos in the middle. Fold the remaining half and set aside for another use. Brush each phyllo with the butter and place alternating from horizontally to vertically, part of it covering the sides of the baking tin. Brush each new addition of phyllo with butter. After adding half of the phyllos add the cream. Start folding the protruding edges, one layer at a time, adding another phyllo on top and brushing with butter. Continue adding the protruding phyllos, brush with butter, add a phyllo and continue until all have been added. Brush the last one with butter and score lightly until the knife reaches the level of the cream. Wet your hands with water and sprinkle a few drops on top. Repeat once more. Bake in a preheated oven to 180οC / 350oF for about 45 minutes (I baked it in a convection oven to 170οC / 338oF for about 35 minutes) or until golden on top. Set aside, until it cools and then refrigerate. Do not cover it, when still hot, so that the top remains crispy. Love anything with filo pastry! 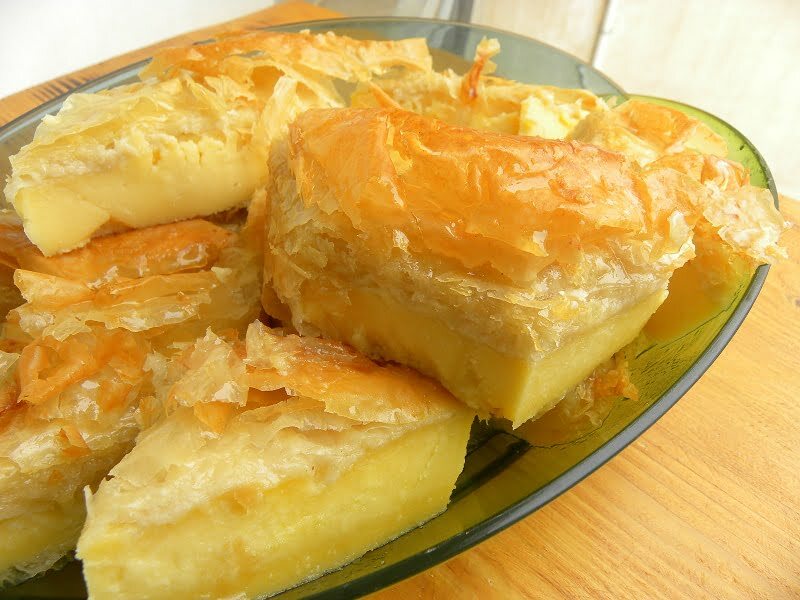 Galaktoboureko looks flaky and extremely delicious..
Oh, Ivy, this is a lemon lover’s dream dessert! That’s me and this looks fabulous! And kudos to you for adding lemon curd! Just amazing! This gets added to my Lemon Everything pinterest board and bookmarked for a summer treat. I can only imagine how lemony great this is! Oh my that looks wonderful. I don’t have ewe’s butter but I think I could source everything else. I would love to taste this. Maureen, just use clarified butter and will still be great. Thanks for visiting. yummy!, your recipe is is a real treat for those who love the taste and flavor of lemon.